This is a post I did for my blog a while back, and I thought I would share it here. I'm mostly trying to generate content for the forum, but hope some of you may like it. Earlier I did a post looking at the clothing choices of some early 20th century cold weather explorers. You can see the post here. There has been a lot of speculation about the performance characteristics of different types of clothing, so I decided to do some research and see if I can find any actual scientific studies, which produced data on the subject rather than subjective evaluations. Interestingly, I found that such tests have actually been performed on both George Mallory?s clothing as well as that of Robert Falcon Scott and Roald Amundsen: Benchmarking Functionality of Historical Cold Weather Clothing: Robert F. Scott, Roald Amundsen, George Mallory, by George Havenith, Department of Ergonomics (Human Sciences) Loughborough University. The photographs used in this post are from the study. 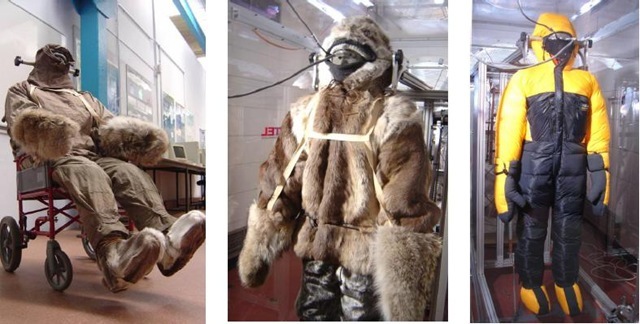 The below picture shows a side by side of Scott?s, Amundsen?s and a modern cold weather suit, used in the test. 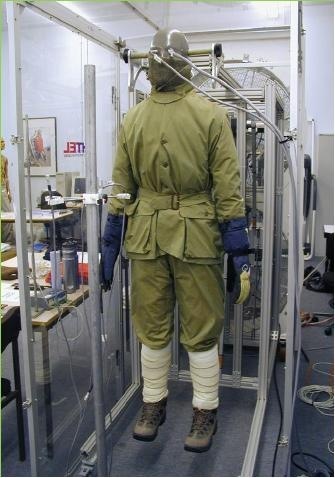 Here the same clothing can be seen on the thermal manikins. Here you can see Mallory?s clothing as used in the test. The study was performed at Loughborough University and the clothing of Mallory, Scott and Amundsen was compared along several categories and factors to modern cold weather clothing, containing fleece and down insulation. Of the vintage clothing, the warmest possible combination of items was used for the test, with the Amundsen clothing being tested with both the reindeer and seal skin outer layer in the alternative. Each clothing arrangement was placed on a thermal manikin is a controlled temperature environment. The insulation values were measured in units of clo (1clo=0.155 m2C/W). The first test looked at insulation without the addition of any other factors such as wind. The graph below shows the results. The results clearly show that the insulation value of modern clothing is higher than any of the other options. 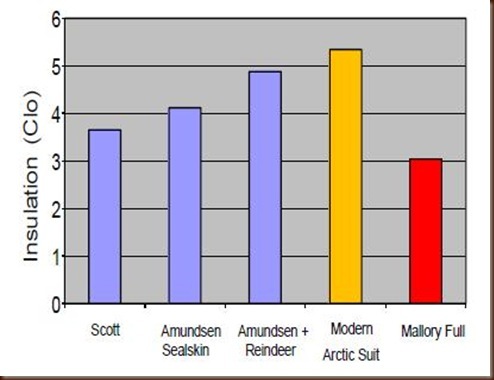 The Amundsen clothing with reindeer shell has the next best insulation, followed by Amundsen?s clothing with the seal skin shell, followed by Scott?s clothing, and in last comes Mallory?s clothing. It has been mentioned by some people that Mallory?s clothing was lighter than modern clothing used on Everest trips. While objectively true, it also provides significantly less insulation. The second test, or more accurately, calculation, shows the insulation value as compared to the weight of the clothing. In the chart below we can see the insulation value (clo) per kilogram. Here we can clearly see that for the weight, the modern clothing significantly outperforms the vintage options. 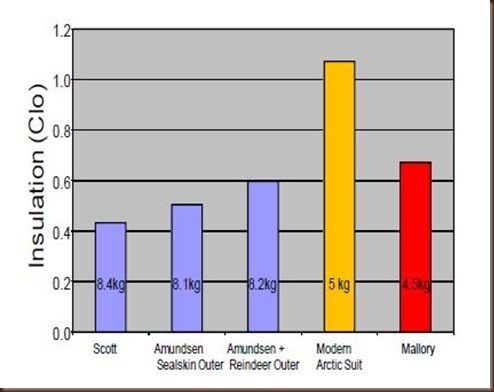 The modern clothing provides more than twice the insulation per kg than Scott?s and Amundsen?s clothing, and 1.65 times better insulation per kg than Mallory?s. The third test looked at how much insulation is retained when the clothing is exposed to wind. The chart below shows the insulation value as a percentage of the static insulation. 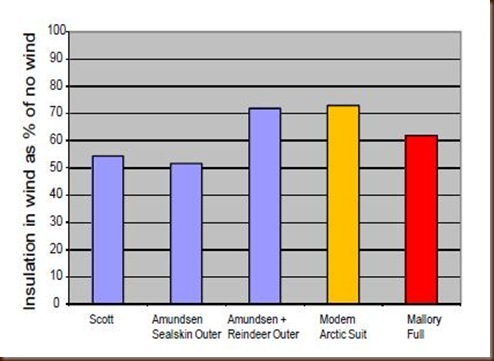 The modern clothing again shows to be the best, closely followed by Amundsen?s clothing with the reindeer shell. A fourth aspect of the clothing was tested in a study by Dorman LE. Havenith, The Effects of Protective Clothing on Energy Consumption During Different Activities, Eur J Appl Physiol. 2009 105(3):463-70. The study showed that not only weight, but also the bulkiness and layering of clothing contributed to energy consumption. Simply stated, bulky clothing makes it harder for you to move, and makes you use up more energy for the same tasks. The table below shows the increase in metabolic consumption caused by each clothing option looked at above. There is no exact data for Mallory?s clothing, but the study concluded that the layers of silk between the wool would make movement easier, decreasing the metabolic expenditure when compared to that of Scott who used similar wool layering. It is again clear that the modern clothing is a lot less cumbersome, and requires less energy expenditure to operate. 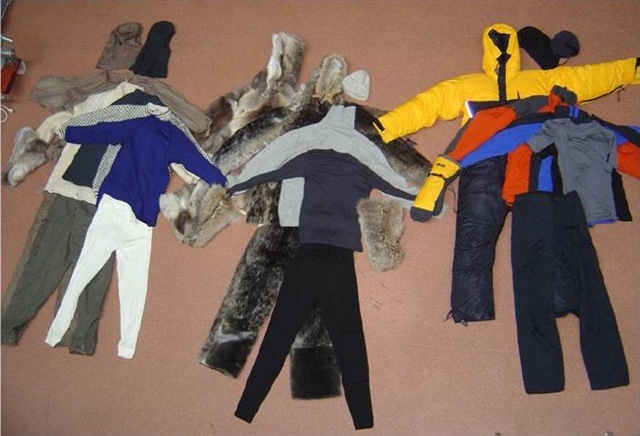 The conclusion reached by the above studies is that while Amundsen?s clothing provided better insulation than Scott?s, considering that Scott largely man hauled his sleds to the pole, unlike Amundsen who used dogs, the clothing would have provided adequate insulation. Both Amundsen and Scott would have found their clothing deficient during periods of inactivity, as was in fact noted by Amundsen in his journal. The big problem for Scott would have been the high energy expenditure required by the clothing. 24% increase in energy consumption is significant and would have greatly contributed to the expedition?s unfortunate end. With respect to Mallory, the studies concluded that his clothing would have been adequate down to -30 degrees Celsius. However, if any high wind speeds were encountered (above 40 km/h), or there was any inactivity, the clothing would have been deficient. Fascinating post! I'm digging the history behind it as well. It is interesting that Mallory's clothing had a pretty high weight to warmth ratio relative to the others (aside from modern gear). I wonder how one could use the findings to build an outfit that would be the best compromise between more "traditional" clothing, and actual insulation value? In the mean time, I'll continue to use modern clothes. Thanks. You should check out the movie The Wildest Dream. In it two modern climbers try to use Malloty's clothing for part of the climb. Eventually they change back into modern gear, but it's good to hear their evaluation. Well I don't know much about the R factor of modern textiles, But I do know that I've spent some hellish cold day's outside dressed in "traditional" clothing, that being wool long johns, wool pants with buckskin leggins, linen shirt covered by a wool shirt and a long blanket coat, footware consisted of wool socks and high topped eastern moc's with sheepskin liners, sheep skin mittens for the hands, and wasn't ever cold. I think the main place where there is a difference is the weight and ease of movement. Because of that, I don't think we can see any significant difference under anything but the most extreme conditions. Where I live in southern NY, it makes no difference. I have worn traditional wool clothing as well as modern clothing, and the differences here even during winter are hard to detect. If you are doing something extreme like crossing the Arctic, then it matters because every bit of energy and every ounce matters. Like Richard Weber (the guy who reached the North Pole on skies in 1995) said, "You can survive in the Arctic wearing almost anything-witness the early explorers, who dressed like escapees from a lunatic asylum, but didn't die. The trick is not to waste energy just keeping warm." I'll have to look it up. Is it available on netflix? I'm not sure, but you can certainly get it as a torrent. Great info and research on this. I will say that traditional arctic footwear is much better for keeping feet warm and dry. Modern boots just don't move enough moisture out for longterm wear day to day. Did they do a study on longterm day to day use for the clothing? Down if not dried out everyday will eventually lose it's insulation after about a week. that was some good reading, and i think ill stick to my more modern clothes for now thanks for sharing that with us Ross!